That was the blessing that nearly every woman bestowed upon me as they kissed me on the cheek hello. Each of them were careful not to smudge my makeup as they wished me a thousand days just like this one, and even though there’s been a week for the afterglow to fade, I can honestly say it was the happiest day I have ever experienced in my 31 years. On March 31, 2019 over 100 of the most special ladies in my life filled a room to shower me with love and with gifts that I would use to start a new life with my husband to be. Never in my life have I ever felt such a positive, loving energy. An ethereal presence filled the room as everyone entered, astonished at the attention to detail given to our lemon-scented Southern Italian Piazza theme. Fifteen years ago, I stood in the very same banquet room at Gargiulo’s restaurant in Coney Island to celebrate my sweet 16! It was so surreal to be in the very same space so many years later, celebrating my bridal shower. For decades, Gargiulo’s has been the backdrop of so many of my family’s special events, and we can always count on the wonderful Russo family to deliver an unforgettable experience thatmakes us feel like family. Guests were greeted with trays of Aperol Spritz cocktails and ice-cold shots of limoncello. A feast of classic family style antipasti followed, as well as pasta alla caprese and several choices of entrees. Needless to say, no one went home hungry! A bridal shower is a riteof passage in an Italian-American woman’s life. As immigrants, we’ve put our own Italian spin on this predominantly American tradition, but in my opinion we’ve only improved it! In our culture, the celebrations leading up to a wedding are steeped in enduring tradition, but it’s not just about one big day.. As Nonna Romana recalls, back in Italy a bride’s trousseau or corredo, a collection of custom-made linens, bedclothes and other household items, would be displayed all over the brides home. The bride and her family would receive guests in the months before the wedding for coffee and cookies, andthey would each have a chance to admire this part of her dowry for her new life. “Brides who came from wealthy families would have panna dieci, which meant that you had ten of everything! Ten tablecloths, ten nightgowns, and ten sets of sheets! Some families would even have to sell land to marry their daughters off then. 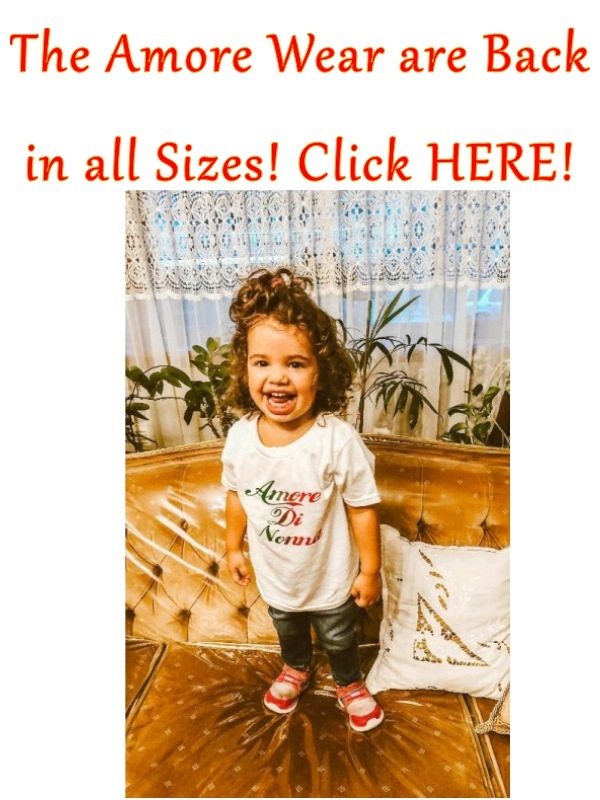 It was a different time,” My Nonna Romana reminds me as she shows me the linens that she and her youngest sister, my Zia Chiara, had painstakingly hand-embroidered for me. The little mother of pearl buttons shone under the fluorescent lighting of her basement kitchen. The off-white satin ribbons were delicately intertwined through the embroidery and tied into small bows in the corners. I remember the day the two of them tied the very last bow together and sealed the linens in a bag when I was just fourteen years old. They’ve both waited so long for this very occasion. I suddenly feel guilty about the Donna Karan duvet on my registry, but I know that I would never want to risk ruining such a beautiful garment. Someday I’ll show it to my own daughter, so she may understand the true meaning of this tradition. As many of you know, I am the only daughter in my close knit Italian-American family, so there was no way my bridal shower was going to be a small, intimate affair. Before I was born, my mother Angela wished for a baby girl so badly! She waited patiently for 31 years to give me the kind of bridal shower she had always dreamt of. In many ways, I can say that I was a bit more excited for my bridal shower than my wedding day, because a bridal shower can be so much more personal and reflective of all the love I feel for the ladies who raised me and made me who I am today. My mother and I were so excited to plan this once in a lifetime event. Here are a few details that made my shower extra special. I was beyond lucky to be able to plan such a joyous event with one of my best friends. A few years ago I met Maryla when I hosted the Miss Italia New York competition in Manhattan. We both went our separate ways after that, but we reunited several years ago when I began my culinary tours. Since then Maryla and her husband Giuseppe have startedanevent planning company, Art of Perfection Event Design, specializing in destination weddings in Italy. They help couples take the guess work out of creating an unforgettable and entertaining destination wedding, which can be a daunting task. When my original plan for an Italian destination wedding didn’t quite pan out (more on that another time! ), Maryla was tasked with bringing a little bit of Italy to Brooklyn for my bridal shower, and boy did she deliver! I had always known I wanted a lemon themed bridal shower —something fresh and bright and girly! Before I knew it, our simple lemon theme evolved into a Southern Italian piazza during feast time. Every day, Maryla had a new idea for one-of-a-kind pieces (many of which my Papa Vito built himself) that made our event totally unique and very personal. She and her team of lemon-clad assistants took care of every detail for me from start to finish. Maryla, for one, has been waiting to plan my wedding and bridal shower for nearly a decade. I can say with total confidence that she was one of the happiest people for me when I got engaged back in August, and she put this entire shower together with nothing but love. She really is one of those very special people, you know, the kind who are always smiling and never get mad or upset when something doesn’t work out. Planning events is super stressful, but through it all she really helped calm me down because she reminded me of the love story that exists beyond the party. Through the incredible stress of shower planning, Maryla held on and kept believing in the fairytale for me when I was too frazzled to believe in it myself. They also created the most exquisite yellow mercato dei fiori, or flower market, to live within our pugliese piazza. Romantic roses, vibrant ranunculus and lemon greens were all placed against the backdrop of the trulli of Alberobello. Everyone felt like they were actually in Italy! Each guest was allowed to create their own bouquet of flowers, but he flower market display actually looked so gorgeous no one wanted to touch it! Luckily Maryla’s assistant Carolyn handed leaving guests a lovely bunch of flowers as they all left. Once we saw the invitations we decided to incorporate the majolica tile design throughout the entire shower. Maryla draped every table in gorgeous blue and white majolica tile overlay tablecloths and accented them with yellow napkins and gorgeous clear-stemmed blue wine glasses that really tied the whole table together. Guests took the wine glasses home with them as a beautiful keepsake. For place cards Maryla had each guest’s name written in gold on real lemon leaves, which were pinned to real lemons. This provided a lovely pop of color! Rossella’s mercato proudly displayed products that mean so very much to us as a couple and will literally feed our family. I was so excited to see both my cookbooks on the adorable vintage crates, along with amazing vintage props. Ok! So my bridal shower definitely wasn’t short of photo opportunities! Maryla set up this adorable bistro set against a custom backdrop my wonderful mother hand painted herself. She personalized it with our names and the name of Nick’s family’s store, and I couldn’t believe how adorable it came out. Real espresso cups and a moka pot completed the entire setup and everyone had such a lovely time taking photos here. Especially one of my flower girls, Victoria! As someone who comes from a long line of seamstresses, I can really appreciate this beautiful art form. Lauren’s pieces are keepsakes that I will be able to share with my daughter one day. Even Nonna Romana was impressed with Lauren’s beautiful work. I never even went shopping for a bridal shower dress! I called Lauren and begged her to find the time in her incredibly busy schedule to make me something feminine and totally one of a kind. As luck would have it, she said YES, and we began what can only be described as a thrilling design process as I watched my dress come to life before my eyes. Sitting down with Lauren, I was able to be a part of the whole process. From picking swatches to feeling fabrications for each fitting, I could appreciate and admire the true craftsmanship every step of the way. I remember the moment Lauren and I chose to add the straps to my dress, which took everything to the next level. We stood in front of the mirror giggling with excitement as she sewed tiny flowers to the straps one by one. My custom bridal shower dress consisted of beaded chantilly lace with delicate feathered flowers imported from Paris with silk wool from Italy. The dress took about three months to make, and over a dozen hours of hand sewing every detail to perfection. The silhouette of the dress was fitted with a flared peplum at the bottom to give it a fun, yet flirty look. I can’t wait to start making another important dress with Lauren! You’ll all get to see it soon! My friend Fendi Tan of Pilo Arts Salon created classic glamour waves that finished off my look, and my gorgeous friend Lisa of Glow & Style Bklyn gave me a glow that made me look like I was kissed by the Puglia sun! Bridal showers are full of traditional games and rituals. I wanted to make sure everyone had a great time, so my maid of honor Enza and I decided to keep it simple and only play three games. The second game we played was the apron game. In the apron game, I took a walk around the party wearingan apron withmany different items pinned to it hoping to not draw too much attention to myself. The first person to take notice and write down all the items correctly won a prize. My maid of honor also left recipe cards on each place setting and had every guest give me one of their personal recipes for me to take home. I love special touches like that! An incredibly special, one-of-a-kind element of my shower was the Rossella sign that stood at the entrance of the banquet room. This sign was commissioned by my wedding planner, Maryla after she decided we really needed something unique to wow guests as they walked in. Mission accomplished! The sign was designed by my mother and built by my papa Vito over several weeks. It was modeled after the feast lights that they use in Italy during times of great celebration, so it was only fitting that we built one for a bridal shower! Oh, and I think he did a pretty good job! The centerpiece of my bridal shower was without a doubt the hand painted 8x8 foot Majolica tile wall my mother Angela painted for me. My papa Vito built the frame and stretched the custom canvas while my mother copied the design of the majolica tablecloths precisely. The wall was used as a unique photo backdrop for guests to take pictures, and it really brought the entire room to life. I knew I wanted a really cool wall to use as a backdrop, but nothing made much sense with our theme. At one point I considered making a wall out of real ceramic tiles, but that would have been way too heavy and hard to move. Then I remembered that my mother is an artistic GENIUS and can paint absolutely anything! She was super excited about this project, and worked day and night to make it absolutely perfect! Grazie Mamma, you’re the best! Mamma Angela also hand painted this beautiful busta box where people deposited their envelopes especially for me. Every element of my shower had an Italian flair to it. The box reads per la sposa, for the bride. I’m currently trying to find a special place for it in my new apartment! Mamma also made me a beautiful wishing well completely covered in eyelet lace. She’s so talented! I opted to give my sisters-in-law, maid of honor, and flower girls beautiful purses as thank you gifts. Calogero wrapped them all beautifully with silk flowers that matched the theme and adorable name tags. Only in Brooklyn! And since my Mamma can’t resist painting anything, she also decided to make small paintings as “Thank you for coming” gifts that guests took with them as they left. My Mamma Angela’s birthday was two days earlier, and she was working so hard finishing all her creations that we decided to celebrate at the shower! I had a special cake brought in for her as our dear family friend Francesca Cavaliere sang happy birthday to her in unison with the whole room. You could really feel the love for the best mom ever! When it came to presenting desserts, I’m going to admit that I broke with my family’s tradition and went for a dessert table in lieu of a tray of homemade cookies on every table like my family has done for years. I had some very specific ideas about my dessert table — I happen to take dessert and sweets very very seriously! I also knew I wanted a mix of desserts from both my Italian and American heritage to be showcased. God bless my Nonna Romana and Zia Rosa, who spent days baking the traditional almond cookies and taralli from my family’s home town of Mola di Bari for my bridal shower. A deep fear had always lived within me that they might not have been able to bake for my special day like they had for all the past brides in my family, and I am overwhelmed with gratitude that God kept them healthy for this. They sprinkled every single cookie with so much joy it made me cry! I did some baking myself for the shower and I even came up with a new recipe you’re all going to love. These light lemon ricotta ring cookies with lemon glaze will melt in your mouth! They didn’t even last five full minutes at the bridal shower, so make sure you bake a few extra if you’re going to make them for a party! My maid of honor, Enza. I met Crescenza Daniela Vittoria Cristino 30 years ago at a McDonalds on Bay Parkway in Brooklyn. Why she has chosen to be my friend this long is completely beyond me because she really is the sweetest person ever (and I’m not always that pleasant) I’m so glad she’s going to be by my side on my big day. I couldn’t imagine anyone else up there with me. Pinch me! New York Times Bestselling author Adriana Trigiani came all the way to Coney Island to attend my bridal shower and I still can’t believe it. Adriana has been such a mentor and inspiration to me, I feel so blessed that she could share in the showers of happiness I felt all day. By the end, I was absolutely exhausted! But Adriana was close by with some words of wisdom that I am choosing to keep in my heart. By the time my fiancé Nick showed up towards the end of the shower, I was absolutely drunk with happiness. I was filled with so much love for him, because he made me a bride and the love we share was the reason behind this glorious celebration. Nick could feel the love in the room as we walked through the dance floor, and everyone applauded with so much joy. For us, it was a delightful sneak peek of our wedding day, which is just around the corner. It was a shower full of Amore! The best day I could have ever asked for. I wish I could do it all over again! That night as I laid my head to rest I could hardly believe that it had all gone by so fast. It was finally my turn.